Background: Beverages made with the addition of soybeans are a convenient way to include soy protein in the diet of consumers. The purpose of this work was to develop a mixed beverage based on açaí, acerola and monbim pulps, added with soybean extract. Methods: The formulations were subjected to analysis of pH, soluble solids, titratable total acidity, color, anthocyanin and flavonoids content, vitamin C and total antioxidant activity, as well as to study of the rheological behavior. Results: The formulations F1 and F2 presented no statistical difference for pH, titratable total acidity and total soluble solids analysis. The ascorbic acid content and antioxidant activity obtained for formulation F2 were higher than that obtained for formulation F1. All the rheological models studied (Ostwald-de-Waele, Casson, Herschel-Bulkley and Newton) can be used to describe the rheological behavior of the beverages. 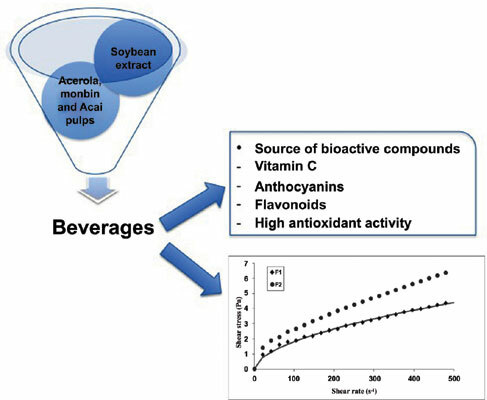 Conclusion: Mixed beverages presented high levels of vitamin C, anthocyanins and total flavonoids, besides high antioxidant activity, to be considered as sources of bioactive compounds. Regarding the rheological behavior, the formulations presented a non-Newtonian behavior, with pseudoplastic characteristics. Bioactive compounds, color, fruits, mixed beverages, rheology, soybean.